If you’re like many independent medical practices, you likely spend a significant portion of your time reporting quality measures to Medicare, Medicaid and private payers. A study found medical practices devote an average of 785 hours per physician at an average cost of $40,069 per physician annually reporting these quality measures. For this reason, many medical practices are now partnering with Recovery Specialist Inc for all billing and claims needs. This type of partnership enables your medical practice to focus on what you do best – care for patients – while Recovery Specialist Inc helps you get reimbursed for that care. One of the most talked-about programs with a reporting burden is MACRA. As an independent medical practitioner, understanding whether or not you’re exempt from mandatory participation can be complex and time consuming. 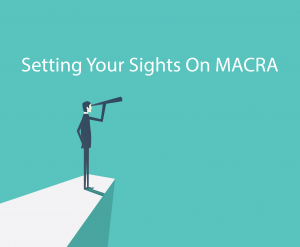 With a dedicated MACRA specialist on staff, Recovery Specialist Inc can help you understand your options and evaluate your practices current situation to avoid any potential payment penalties. This specialist will gather, review, and submit all necessary documentation to ensure your medical practice is compliant and efficient when dealing with MACRA. The Centers for Medicare & Medicaid Services (CMS) issued the much-anticipated 2018 final rule for the Quality Payment Program (QPP) created under the Medicare Access and CHIP Reauthorization Act of 2015 (MACRA). Under the QPP, providers are rewarded for improved outcomes and value either through the Merit-Based Incentive Payment System (MIPS) or the Advanced Alternative Payment Model (APM). Conversely, providers can be penalized in future Medicare payments for failing to submit data or not meeting benchmarks. Is Your Practice Required to Participate? CMS exempts practitioners with a low volume of Medicare patients as well as those new to Medicare Part B. Fewer clinicians in 2018 will be required to participate, since the final rule raises the low-volume threshold that exempts physicians from MIPS participation. Physicians with less than $90,000 in Medicare Part B charges and 200 patients annually are not subject to MIPS. Don’t worry though; Recovery Specialist Inc can assist with checking whether your practice is required to participate in the QPP. If your practice ends up being required to participate in the QPP or chooses to voluntarily participate, Recovery Specialist Inc will file all necessary documentation to participate in 2017. You only need to report on one measure for just one patient in 2017 to avoid the negative four-percent adjustment to Medicare payments in 2019. For the minimum participation option, Recovery Specialist Inc will work with you to complete the following steps listed below. Choose one quality measure from the available performance categories, one Improvement activity or elements within the Advancing Care Information category. Use the CMS Quality Measure Search Tool to select which reportable measure applies to your practice. Determine how you’ll report the MIPS data. Collect information about the chosen measure by the end of 2017. Submit 2017 MIPS data by February 28, 1018. In addition to fulfilling each step for your medical practice, Recovery Specialist Inc will evaluate how your practice currently operates to highlight any process deficiencies that could potentially be cutting in to your bottom line. Unsure of where to go from here? Call 631-736-4064 to speak with one of our knowledgeable MACRA specialists who will learn more about you and your medical practice, examine YOUR current situation, and discuss a strategy on next steps.